Feb 20, Sat., 6-8pm: Currents Gallery, McMinnville, solo, for opening of art show "My Little Town". Feb 25, Thurs, 3pm: Country Meadows, Woodburn: "Music of the Oregon Trail". solo. June 24, Wed: (Tru & Wes) Party/Dance for Regional Center on Deafness, Monmouth. 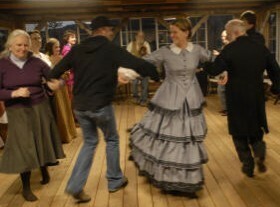 June 27, Sat Evening: Portland, Wedding Dance, with Cash & Co.
July 3, Saturday, 12 to 2: a jam of fiddlers, (John Adams, Roger Applegate, Jean and Luanne Fugal, Adam Price, and myself), in Independence Riverview Park. 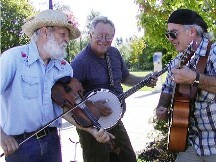 July 8, Thurs, 3 pm: Country Meadows, Woodburn: "The Music of Woody Guthrie". solo. Aug. 5, Thursday: Oregon State Hospital, 3 pm, solo. Music of Lewis & Clark/The Oregon Trail. 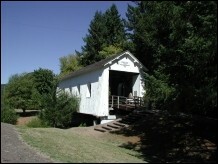 August 21, Saturday: Barn Dance at Champoeg State Park, 6-8 pm; in the old barn near the Visitors Center; as part of Grain Harvest day, with many pioneer events all day; music by Worn-Out Shoes. Nov 3, Wed, 3pm: Country Meadows, Woodburn: "The Music of Pa Ingalls" (of the Little House on Prairie). solo.